Proud 1963 classmates. Front row-Bud Wiseman,Judy Cooprider Timberman,Sue Shadwick Sanders,Diane Chitwood Brock. 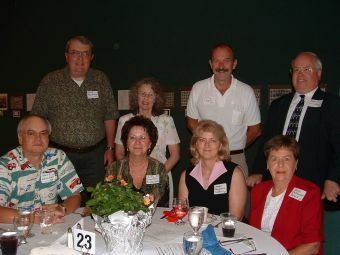 Second row-Dave Abplanalo,Joan Alfred,Jerry Cooper,Bob Grosskruetz.Taken at the Alumni dinner,6/7/03. With a major in mathematics and a minor in German, I graduated from Purdue University in 1967, and completed my Masters’ degree from Purdue in 1972. Through the years, I have taken additional courses at Butler, Indiana State, Portland State, Stanford and Clemson. I taught from 1967-1970 at George Washington High School in Indianapolis. 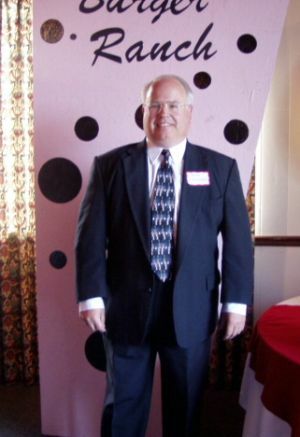 I have been teaching mathematics at Mooresville High School since 1970 and have served as the chairman of the department for the past 25 years. Currently I teach Advanced Placement Calculus. After 36 years of teaching, I am finally getting to use my license in German. I have one class of third-year German. In addition to my duties as department chairman and teacher, I served as junior class sponsor for three years and senior class sponsor for 22 years. I take photographs at most of the extra-curricular activities at Mooresville High School. I have received several honors including, WTHR”Teacher of the Week “and finalist for the “Indiana Teacher of the Year”. With grants from Hewlett Packard and Oregon State University, I have worked with using technology in teaching Advanced Placement Calculus. My hobbies include photography and travel. My favorite destinations are Norway and Vancouver Island. I have visited my relatives in Norway numerous times and enjoy frequent contact with them via telephone and e-mail. I have also enjoy playing the organ and served as church organist for twenty-five years. At our 30th reunion, my mother brought my dad to our picnic. Dad, who had already suffered several strokes, enjoyed seeing members of the Class of ’63. He passed away in 1995. 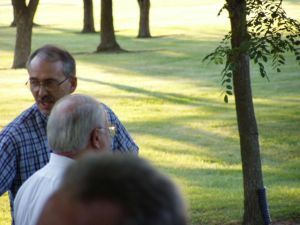 Bob and Allan Kellum talking at the cookout.